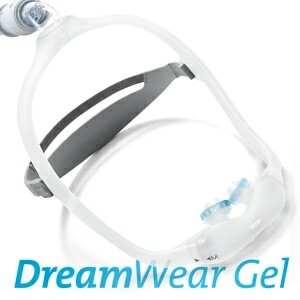 The Breeze SleepGear CPAP Mask with Nasal Pillows provides the comfort of a custom fit, with multiple adjustments and nasal pillow sizes to choose from. Unlike traditional sleep therapy masks, the Breeze has no confining straps. The integrated one-piece design floats over the face and contours the head; and the headgear halo straps are positioned high on the head to avoid red marks on the cheeks and blocked vision. The Breeze can even be worn with glasses. In response to patient feedback the already innovative and popular Breeze SleepGear system has received some welcome comfort and durability enhancements including: an improved Hose Guide constructed from MUCH STRONGER materials, halo headgear straps that can be positioned for greater flexibility and a more secure fit, thicker and more comfortable padding on the cradle at the back of the head, and a quick disconnect cuff at the end of the mask's short tube. Each Breeze mask comes standard with three sets of nasal pillows (Small, Medium & Large). DirectHomeMedical offers additional pillow sizes as an optional add on in your shopping cart; so if you know your size you can purchase additional sets to keep as backups and if you're not sure of which size will fit best for you you can purchase multiple sizes to try! In the Package Breeze Nasal Pillows CPAP Mask with 3 Sets of Pillows (Small, Medium, Large) and Adjustable Headgear. Add Extra Pillows in Shopping Cart. all soft cuff CPAP tubing -- like standard tubing, performance tubing, smooth bore tubing, etc. 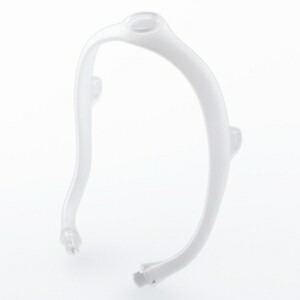 Not Compatible With Hard tubing cuffs -- like those found on ThermoSmart Heated Tubing and UltraLite Tubing. Hard cuffs can sometimes cause the Breeze swivel adapter to slide out of the tube during use. 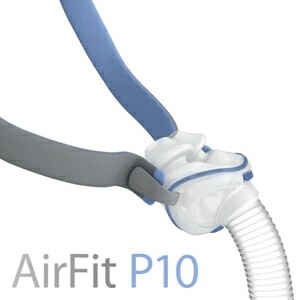 If you are using a Breeze and tubing with hard cuffs, add a FlexiTube Angle Adapter, between the mask swivel and the CPAP breathing tube, to ensure a safe and secure connection.